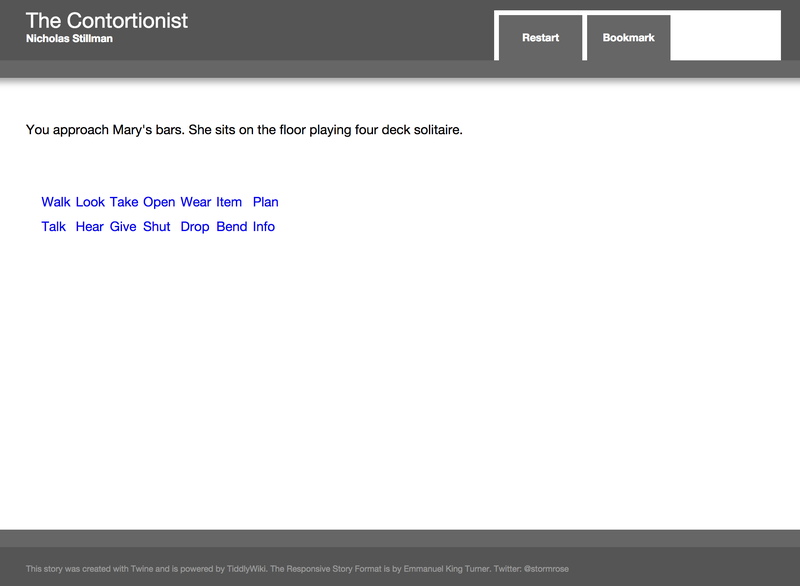 The Contortionist is a puzzly game that uses a menu of verbs, somewhere between parser and choice-based. I played for a while normally, then as much further as I could with the walkthrough, until I got to a point where the walkthrough did not help. The premise here is that you’re wrongly imprisoned, but you have the ability to squash and bend your body, so you need to collect items that will be useful in order to break out of your prison. The other prisoners also have small possessions that may be useful to you, if you can get them to share. To make matters more complicated, a guard does the rounds on a regular basis, so you need to watch the time and make sure you’re back insid your own cell rather than wandering the cell block when he shows up. The verb menu keeps the range of possible options from being obvious: BEND or TAKE, for instance, will do different things in different circumstances, and it’s only by drilling down through the menus that one works this out. The back button also functions as UNDO, which is helpful. The whole arrangement felt slightly awkward to me, but I’m not really sure whether that’s down to a real problem with it, or simply the fact that I’m not as used to this hybrid as to many of the alternatives. The story mostly feels like a support mechanism for the puzzles: there are other characters, but they mostly have quirks that supply challenges or ways that can be helpful, rather than really developed personalities. There might be some kind of message about the prison-industrial complex implicit in the fact that the prisons are filled with randomly selected inmates, but it’s all (I felt) a bit too non-realist to really work as social commentary. The puzzles themselves hung me up. Possibly my brain is just working askew from the way the author thinks, but when I went to the walkthrough, several of the possible object uses surprised me and were not things I would have thought of on my own or guessed at from the text. Once I’d seen that that was the case, I worked from the walkthrough for a while until I got stuck even there. Other reviews: Antimony, Jason Dyer, Loki. This entry was posted in Competitions, interactive fiction, Reviews, user interface by Emily Short. Bookmark the permalink.